Written by CMOS Bulletin SCMO on March 22, 2019 . Posted in Climate, Weather, What's Current. Communicating about climate change is a tricky business. For decades, there has been a persistent gap between the actions that climatologists are calling for and what the public is doing about climate change. Climate change communication research aims to address this gap. Historically, public disagreement about climate change and other science topics has been attributed to a “knowledge deficit”: if people only had the facts they would come to agree with the scientists and the controversy would be eliminated. Unfortunately, a wide variety of research has demonstrated that simply presenting the science is not sufficient for changing hearts and minds about climate change. Despite being able to access the science, many people’s thinking about climate change is characterized by “psychological distance”: climate change is perceived as something happening far away, to other people and in a hypothetical future. Not as something happening here and now that is relevant and actionable for the average Canadian. There are various factors that contribute to psychological distance around climate change. By way of political narratives presented in the media, climate change has become a polarizing issue creating doubt about the reality and seriousness of the issue. Climate change is also conceptually difficult for people to understand. The notion of natural, stochastic changes in local weather happening against the backdrop of a gradual, human-caused shift in the global system is hard for people to wrap their heads around. Further, many scientists struggle to adapt their messages about climate change to a lay audience. Climatologists deal with statistical data about possible climate scenarios; however, this type of information often fails to resonate with the general public who are more likely to base their opinions of climate change off of their observations of local, short-term weather. Research has identified that weather broadcasters have potential to manage these challenges and effectively communicate about climate change to the general public. First and foremost, weathercasters have tremendous reach: they are in the living rooms of Canadians across the country multiple times each day. Weathercasters are also familiar figures within their broadcast regions and have knowledge about their local communities. They are apolitical, and this gives them an advantage over other sources for which we might suspect ulterior motives. Additionally, weathercasters are highly-skilled communicators: they are situated at a critical boundary between meteorologists and climatologists and the lay public, and they work everyday to translate knowledge in atmospheric science between those groups. And finally, local TV weathercasts focus on local weather and related topics, creating a natural opportunity to teach audience members about the local relevance of climate change. Research groups in the US and the World Meteorological Organization have already recognized the potential of weathercasters as climate change communicators. The Climate Matters program provides weekly resource packages to weathercasters across the US to help them communicate about the local relevance of climate change to their broadcast region. Climate Matters meteorologist Jim Gandy. Used with permission. A recent study explored weathercasters’ current and potential status as climate change communicators in Canada.1 The study interviewed highly respected professionals in the Canadian weather communication community to ask them of their attitudes, knowledge and behaviours around climate change reporting. Considering the difficulties of communicating about climate change, the research focused on exploring how a Canadian weathercaster might communicate about climate change in a way that is appropriate for their medium, responsible to the science that they’re communicating, and engaging to their audience. As it turns out, the group interviewed had a lot of ideas as to how weathercasters can do this. They provided many examples of how weathercasters could use the broadcast platform to draw the story between climate change and people’s daily lives. The weathercast medium presents many natural opportunities to talk about local, climate change-related events, such as how leaves are changing later in the season, changes in the crop-yields from local farmers, or how the ski season is becoming shorter and less reliable. Each of these phenomena are indicative of a changing climate and also meaningful to the average Canadian. An important consideration for weathercasters is that their communication is responsible to the science. Climate change happens at a different temporal and geographic scale than local weather, and the relationship between climate change and local weather is not straightforward. However, this does not mean that it cannot be described in a way that is meaningful to the general public. There are many examples of how a weathercaster could communicate responsibly about the relationship between local weather and climate change. For example, extreme weather, such as ice storms, can be discussed as an event that’s likely to become more frequent as a consequence of climate change. Our weather has already changed as a result of climate change, so weathercasters noted that climate change gives appropriate context for the stories they tell about local weather and environmental events. For example, if current weather where compared to averages from when records began, almost every season and weather event would be extreme. Climate change has shifted the baseline for what is considered normal weather. In addition, many weathercasters are beloved members of their communities and are often asked to attend town fairs and other public events, which gives them credibility in discussing climate change. Despite weathercasters’ potential to communicate about climate change, it seems that it is rarely brought up on-air. So why aren’t Canadian weathercasters talking about climate change? First, there is a lot of uncertainty as to who is qualified to present on the relationship between local weather and climate change. Weather broadcasters have varying levels of ability and confidence in presenting on climate change depending on the extent of their expertise in atmospheric science. Second, all the interviewees discussed that the reason people watch the weather is for weather forecast information. Including content about climate change could be poorly received by certain audiences or unacceptable to the station management. At the same time, there could be an opportunity to meet growing demand in some markets for more information on the link between climate change and our communities. A third barrier to weathercasters bringing climate change into their regular broadcasts are restraints on time as well as information and narrative resources. 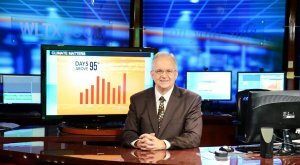 Weather broadcasters and their colleagues often struggle to prepare forecasts and visual aids in time each day, and then to effectively communicate that information in only two to three-minutes of air time. According to the study, there are currently no climate change communication resources for weather broadcasters in Canada. Unlike meteorologists, weathercasters do not have a unified professional forum by which to develop a mandate about climate change communication and distribute resources. All the interviewees said that resources provided by organizations such as CMOS and Environment Canada could help weathercasters effectively communicate about climate change to their viewerships. For example, these organizations could offer training in climate science and communications for weathercasters, or provide region-specific climate data. These resources could increase weathercasters’ capacity to communicate about climate science while helping them to manage time restraints. Finally, leadership among station managers eager to discuss climate change on air would set an example that weathercasters could follow. These findings reveal an exciting leadership opportunity. With further research and resource development, weathercasters will be equipped to communicate critical climate information in a way that resonates with the general public. 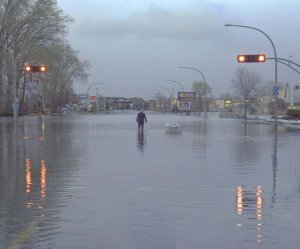 As the effects of climate change become more apparent, Canadians will be searching for explanations for the dramatic changes in their environment, and weather broadcasters will be there to guide them. 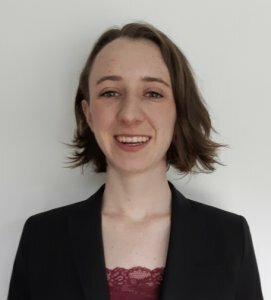 Bronwyn McIlroy-Young is a Masters student at the University of British Columbia studying at the Institute for Resources, Environment, and Sustainability. She is interested in weather and climate communication, science for policy and environmental justice. Her current research explores scientific controversy around emerging contaminants.